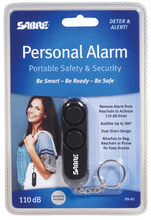 This Sabre Personal Alarm unit is designed to be easy to carry and very effective when needed. The loud alarm (110dB) is created by TWO sirens built into the unit both set to different frequencies. This makes the sound emitted much more noticeable and attract attention. Very compact and easy to carry being only 3 inches long and less than an inch wide. Its about the size of my thumb. Personal Alarm, Portable Safety & Security, Audible Up to 300', Dual Siren Design, Attaches to bag, key chain or purse for easy access. Uses 4 LR41 button batteries which are included.